Workers pack Minnesota Capitol in solidarity with Wisconsin union fight | Fight Back! 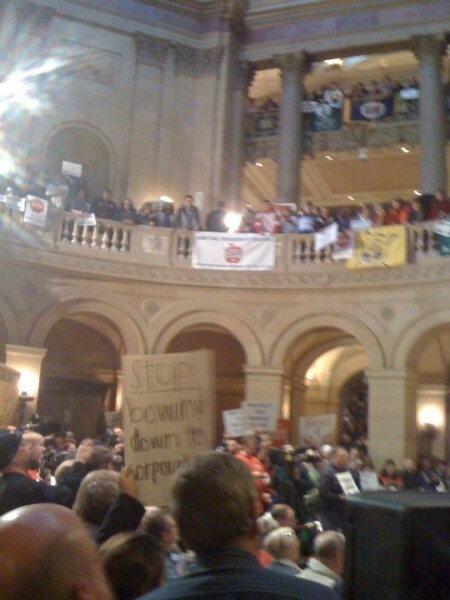 St. Paul, MN - Excitement was in the air in the Minnesota Capitol building, Feb. 22 as more than a thousand workers packed the capitol rotunda in an impressive display of solidarity with workers in Wisconsin. Workers from dozens of Minnesota unions rallied together to show solidarity with the Wisconsin workers’ determined fightback to defend their unions. There the Governor, Scott Walker, is trying to ram through a bill to destroy public sector unions and extract massive concessions from workers. Wisconsin workers decided to fight back on a scale not seen in the U.S. labor movement for decades. They have occupied their state capitol for over a week now, have held rallies day after day of up to 70,000 people, while teachers have called out sick, shutting down Wisconsin’s largest school districts. And last night, the Madison-area South Central Federation of Labor passed a resolution beginning the process to build for a general strike that could potentially shut down large sections of the state across industries, sectors and cities. The goal of such a strike would be to reverse the Wisconsin governor’s and Republican legislature’s decision to pass the ‘Budget Repair Bill’ that would decimate public sector unions. There has not been a general strike in the United States in decades. At the Minnesota rally, speakers from many unions emphasized the inspiration they have gotten from their union sisters and brothers in Wisconsin. While normally there is a friendly rivalry between the two neighboring states, everyone expressed solidarity with their neighbors to the east. Some protesters wore the ‘cheeseheads’ that the rival Green Bay Packers football fans wear, and a speaker from the teachers’ union captured the spirit of unity saying, “We are here to tell our Wisconsin friends: We are all in this fight together. Today, we are all Badgers!" [referring to the University of Wisconsin sports mascot]. Speakers also made it clear that they won’t stand by and allow anti-worker laws to pass in Minnesota either. Republicans took control of Minnesota’s state legislature this year and want to drastically cut public institutions, public sector jobs as well as services for poor and working people. They have also introduced anti-union bills. They will be sure to meet determined resistance to these proposals from Minnesota’s labor movement.